The Columbia Thyroid Biopsy Program is a leader in addressing multinodular thyroid disease and thyroid cancer. 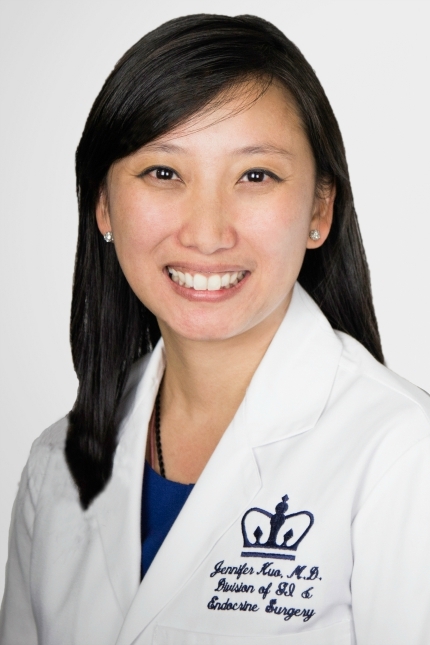 “Our success stems from a multidisciplinary collaboration with surgeons, endocrinologists, nuclear radiologists, and pathologists,” says Jennifer Kuo, MD, FACS, Director of the program. The Thyroid Biopsy program offers same-day onsite evaluations, with surgeons coordinating with cytopathologists to minimize the number of biopsies required to get definitive results. “Patients at other hospitals may get up to eight or ten passes per nodule,” says Dr. Kuo. “We can often get enough cells with three or less. We also offer the latest molecular testing and have developed our own panel to refine the estimate of malignancy in thyroid nodules. Read more about how Dr. Kuo and a team of Columbia doctors saved a family with a genetic mutation related to thyroid cancer.